Seriously, what creature of the dark could resist a wine dubbed Black Forest? Certainly not me. If you’re looking for a delightful red to go with your Halloween festivities, you can’t go wrong with this one. 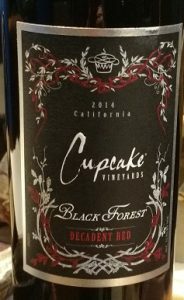 This is the first Cupcake Vineyards wine I’ve tried. Though I’ve seen them in the store the Cupcake brand name thing was just too froof laden for me. Until…the Black Forest. It’s lovely from its label right down deep into its guts. This wine has a beautiful fragrance that releases immediately upon opening. Seriously, my husband could smell it across the room. This is not a bad thing, it tantalizes the senses before its even poured. The color in glass is dark, nearly purple red. Taste wise? Wow. Yeah. It’s smooooooth. One of the smoother reds I’ve tasted that still remain on my side of the dry spectrum. Berries! And I think, perhaps cherry? It’s not listed as a taste on their site but something in there has a decadent cherry-esque taste.